Did you know there is a staff intranet for you, depending on your type of role? Have a look at it, because there are a lot of links that you will probably find useful. 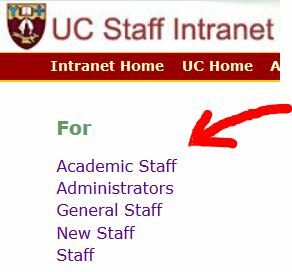 Open the UC Intranet Home page, look in the top left corner, and go from there. The Technology Information for Staff website also has links to the information that you are likely to need regularly at the University of Canterbury. Black Flu – Why should we remember the 1918 influenza pandemic in New Zealand? A century on, the lessons of the 1918 influenza pandemic could help New Zealand plan for a future pandemic, according to UC Emeritus Professor Geoffrey Rice. In this UC Connect video he shares insights into the pandemic and discusses the risk of another major influenza pandemic is even greater now, thanks to international jet travel. Professor Jonathan Morris from the University of New South Wales, Australia arrived on the 9 September and will be teaching in the Department of Physical and Chemical Sciences. We would like to wish our new arrivals and their families all the best for their stay.